At the end of our service last Sunday, our Communion table looked like this. We started the service thinking about the parable of the lost sheep (Luke 15.1-7). We watched a short video animation of the story (see below) and then the children hunted for some toy sheep we had hidden around the church. The lost sheep were bought safely to the communion table where we realized that there was still one missing and so off the children went to search again. Eventually, that stubborn sheep (I think it was called lamb chop) that had got itself really, really lost was found :). As the sheep was brought to the front and placed on the communion table there was a great cheer from the congregation. We then sung and thanked God for rescuing us and then the children headed off to their own groups. Instead of me explaining how Jesus saves the woman, we put this picture on the screen and invited people to think about what the story teaches us. After several minutes, we gave anyone who wanted to the opportunity to share their thoughts and there were some very moving, encouraging and challenging things that were said. Next, everyone was given a stone and we encouraged each other to think about the times when we judge others or when we have hatred towards people. Someone commented that the stones were very hard and that God wants to take our hard hearts and to make them soft as we receive his love and share it with others. After some space to reflect, we shared communion together. 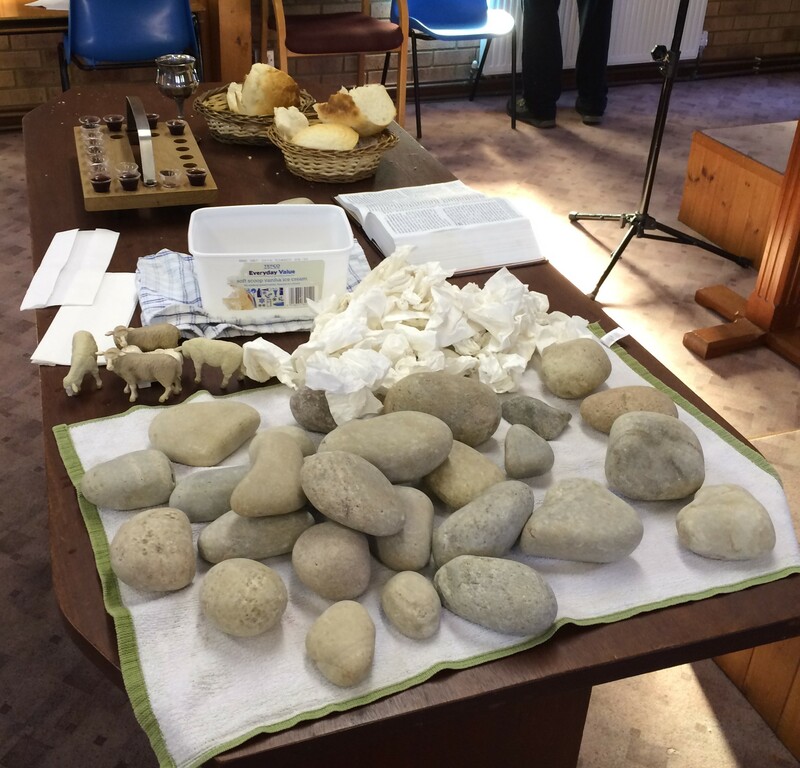 People were invited to bring their stones and to lay them down on the communion table as a sign that they were laying down their forgiveness and hatred. There was a tub of water for people to wash their hands in to get stone dust off but also to symbolize the cleansing that we receive from Jesus who is ‘the lamb of God who takes away the sin of the world’. There were paper towels to dry hands with and these were discarded onto the table as a sign that we were leaving the rubbish of sin behind and that we were beginning again in Christ. As people did this and received communion, we listened to ‘In Christ alone’ set to a video background of Jesus’ rescue of this woman. At the end of communion we reminded one another that we are saved by the grace of God and that it cost Jesus everything. Jesus our shepherd, became like us in order to die in our place; the shepherd became a lamb and he sacrificed himself for us. Our salvation is all about Jesus and we accept it as a gift, but Jesus also said to the woman that she should ‘go and sin no more’. There was then some space to consider how God wants to change us. I hope that we all know that we are loved and that Jesus will accept and forgive us as we turn to him. I hope that we also know that Jesus wants to set us free and to transform us so that our lives are lived in a way that is pleasing to God and also in a way that is better for us and the people around us. May we continue to follow the light of the world! This is an example of the sort of creative communication that we can use in church. If you want to think more about this story from John 8, then you might like to read The one about Jeremy Clarkson. This entry was posted in acceptance, Being honest about our faith, creative communication, Faith, forgiveness, freedom, grace, salvation, Saved by Jesus and tagged communion, creative communication, creative prayer, forgiveness, go and sin no more, God has forgiven us, grace of God, Jesus let go of his opportunity to be rescued so that he could rescue us, Jesus rescuer, john 8, lost sheep, Prayer station, saved by grace, Saved by Jesus, saved from sin, woman caught in adultery, you alone can rescue. Bookmark the permalink. Thank you for sharing this it was inspirational and must have been a lot of fun for the children looking for the lost sheep with such a message!